Just as the Minnesota Twins were climbing back into playoff contention, they have one of their best players to injury. 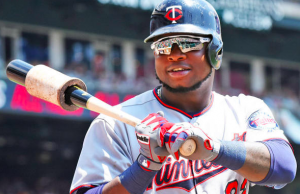 The Twins placed third baseman Miguel Sano on the 10-day DL Sunday night with a shin injury that’s being described as a stress reaction. Sano fouled a ball off his chin during Friday’s win over the Diamondbacks. He finished the game but was pulled in the 7th inning of Saturday’s game after complaining of soreness in his left shin. Sano did not play on Sunday, as the Twins won their fourth straight game. Before the game, Sano underwent an MRI that convinced the Twins to place Sano on the DL without much hesitation. Following Saturday’s game, Sano gave no indication when he expects to return. Sano has been Minnesota’s most impactful offensive player this year. He experienced a sophomore slump in 2016, but has come back strong this year. On the season, Sano is hitting .267 with 28 home runs, posting an OPS of .870. At times, he has carried a lineup that lacks impact players outside of Eddie Rosario and Brian Dozier. Sano is perhaps the player the Twins could least afford to lose, especially with no known timeline for his return. The Twins are expected to call up Kenny Vargas to replace Sano on the active roster. Vargas has hit .243 with eight home runs in 51 games for the Twins this season. However, he’s merely a designated hitter and part-time first baseman, doing little to fill in for Sano at third base. Utility man Eduardo Escobar is the most likely to candidate to take over at the hot corner while Sano is out. Surprisingly, Escobar has 11 home runs and 11 doubles this season after a poor offensive showing in 2016. But he’s still a significant step down from Sano offensively. Ehire Adrianza is also an option at third base, although he doesn’t bring much power offensively. As long as Sano remains sidelined, the Twins will need players like Rosario and Dozier to take on a more prominent roles in the middle of the order. Minnesota has also benefited from a recent hot streak from Joe Mauer and an exceptional performance from young center fielder Byron Buxton. It will take all of those players and more for the Twins to make up for the absence of Sano. The Twins will begin Monday tied with the Angels for the second wild card spot in the American League. However, there are three teams within 2.5 games of that spot. They will also begin a stretch without Sano anchoring their lineup. Even if he only ends up spending the minimum of 10 days on the DL, losing Sano to injury is a huge setback for Minnesota’s playoff hopes.